Join your family and friends as you walk together supporting someone you know and love with Autism. 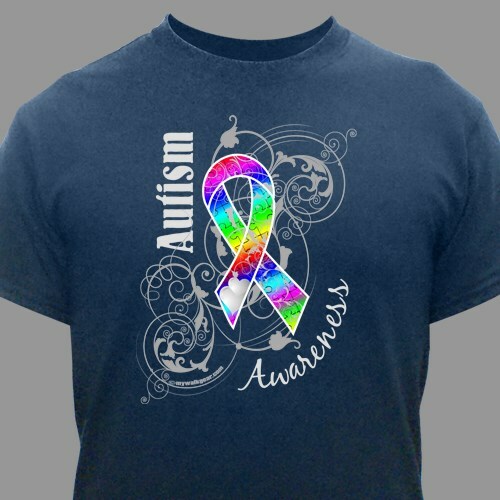 This unique and eye catching designed shirt for Autism helps promote and increase awareness each time it is warn. Wear your Autism awareness shirts at any of your awareness events to show people that you too are a proud supporter. Show your support for Autism today! Our beautiful Autism Awareness Walk T-Shirt is available on our premium 100% cotton black t-shirt, machine washable in sizes youth XS-L & adult S-3XL. Loved the Tshirts I received. I loved that they came in larger sizes and it is hard to find 4X. Wish you did carry a 5X. I like the quality of the shirt. The shirt pictured was what we thought we were getting. To us it looks gray so we chose ash. Apparently it is black. Additional Info Here at MyWalkGear.com, we understand the need for concern and awareness about autism so we have created a unique collection of Personalized Autism Walk Gear and Apparel for you to join in and help support the cause. With our collection of Autism Awareness Gear, you can help support anyone you want, whether it be a family member, friend, co-worker or to just help the community to raise awareness. Show your support today with this great awareness shirt along with our Autism Awareness Dog Tag and our Autism Awareness Two-Tone Mug.